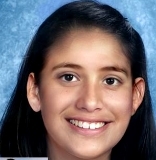 Karla and her brothers, Eddie Martinez and Justin Martinez, disappeared from Los Angeles, California on April 14, 2009. Authorities believe they were abducted by their non-custodial mother, Karla Trejo, and their non-custodial father. Trejo's date of birth is March 20, 1980, making her 29 years old at the time of the alleged abductions. Photographs and additional information for her are unavailable, and there are no photos or any information for the father. The children's parents may have taken them to Mexico. Their whereabouts are unknown and their cases remain unsolved. Updated 5 times since October 12, 2004. Last updated October 29, 2017; details of disappearance updated.